Building a second bus terminal in the basement of the Javits Convention Center to consolidate intercity buses would free up 30 percent of the gates at the existing Port Authority Bus Terminal at 42nd Street. It would also expand options and reduce travel times for many New Jersey commuters. Along with new rail capacity from RPA’s proposal for through service at Penn Station, these two facilities would provide improved service, redundancy, and enough Trans-Hudson capacity until the existing terminal reaches the end of its useful life in the next 20 to 25 years. The Port Authority Bus Terminal is in dire need of renovation and expansion. Bus ridership is at record levels, yet service is unreliable, passenger conditions are dismal, and the building itself hasn’t been updated since the 1980’s and is in a state of deterioration. What’s more, demand for bus travel is expected to increase by 38 percent in the next 30 years. Commuters in much of northeastern New Jersey have no choice but to rely on buses to get into Manhattan—at least until the Gateway and additional trans-Hudson rail service is introduced as part of a regional rail system. Because it is at capacity, renovating and expanding the terminal in place will be difficult and disruptive to the densely developed area that surrounds it. The Port Authority is currently studying a plan that would build additional floors to the existing facility to maintain operations while rebuilding the four floors below, but its feasibility and costs are still unknown. Building a new, larger terminal on a different site, which the Port Authority previously proposed, is constrained by a lack of land and is incompatible with the surrounding redevelopment of the west side. Building a terminal in New Jersey to intercept bus riders before they reach the Central Business District has also been studied, but this would require the construction of a new rail service (and trans-Hudson crossing) to take commuters to their final destinations in the city. In the long term, rail service should be expanded to serve residents of northeastern New Jersey and dramatically improve their commutes, which would reduce the need for commuter buses. This expansion, however, would require the creation of a unified and expanded regional rail system that could be implemented in the next 20 to 40 years. Until then, a comprehensive solution must be implemented to improve commuting options for those 229,000 people who rely on buses every day. The Javits Convention Center is a multiblock site that is adjacent to the Lincoln Tunnel. Its lower level, currently used for overflow exhibit floor space and conferences, could be converted into a bus terminal. Buses could either connect directly into the Lincoln Tunnel via underground tunnels, thus avoiding all vehicular traffic, or reach the tunnel via entrances along the West Side Highway. A new bus terminal on the lower level of the Javits Convention Center would relieve pressure at the existing bus terminal on Eighth Avenue. It could accommodate all intercity bus services and serve as a storage facility for commuter buses during the day. Some commuter service could also be provided at the new Javits bus terminal; as the office district on the far west side of Manhattan grows, commuters may find it more convenient to arrive at Eleventh Avenue than Eighth. The lower level of the Javits Center, and a possible southern extension to 33rd Street, is large enough to accommodate more buses than the current PABT, but ridership levels of a facility this large would overwhelm the #7 train, upon which many travelers would rely. But even a facility of a more limited scale, roughly half the capacity of the current terminal, would be large enough to house all intercity buses, which would free up 30 percent of the gates at the existing bus terminal. The lower level of the Javits Conference Center could also be used as a consolidation and transloading center for freight deliveries, wherein large trucks from the Lincoln Tunnel would have their goods transferred to smaller electric vehicles for Manhattan deliveries. This would help reduce truck traffic in the city—despite the demand for online shopping and instant deliveries increasing in the coming years. Consolidating intercity buses at a new Javits terminal would free up 63 intercity/mixed gates at the bus terminal on Eighth Avenue to be used exclusively as commuter buses, making it easier and far less costly to spruce up the existing station and provide basic upgrades for commuters. The additional capacity could be used to accommodate the growing demand for commuter buses. Travel demand across the Hudson River will continue to grow in the coming decades. In fact, within the next 25 years, it is expected to be at capacity even after two new bus terminals and the Gateway tunnels have been built. At that point, a new rail tunnel connecting 57th street and the New Jersey Palisades should be built, tying in with and allowing passenger service on the Northern Branch, West Shore, and Susquehanna lines. This new rail service, along with bus intercept facilities in New Jersey, would sharply reduce the number of bus riders, potentially allowing the Eighth Avenue Bus Terminal to be demolished and redeveloped, and generating revenue to help pay for the rail improvements. The new line would turn down Third Avenue in Manhattan to 31st Street, connecting with Crosstown Service/Gateway. Additional phases of the regional rail system would bring more service west of the Hudson and connect to new service throughout the region. Travel conditions would be greatly improved at the current bus terminal on Eighth Avenue, thanks to reduced crowding and wait times as well as better passenger amenities. Riders destined for Hudson Yards and other locations west of Tenth Avenue would enjoy an additional terminal option and reduced travel times. Capacity would be sufficient for bus riders through 2040, but a decision to build more rail capacity or rebuilding the existing terminal must be made in the next five to ten years. Redundancy would be provided, in case service to one bus terminal or Penn Station is disrupted. Intercity bus services would be consolidated, removing buses from unloading or parking on streets. Redeveloping part of the Eighth Avenue site would remain a possibility. 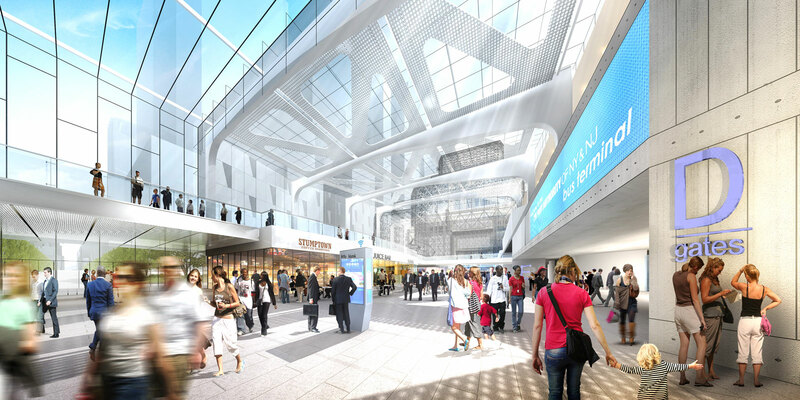 The cost of the second terminal would depend on its size, design, and whether it could be connected directly to the Lincoln tunnel. Total costs would likely be less than the $3.5 billion the Port Authority had previously allocated to replace the 42nd Street terminal. In the long term, the 42nd Street terminal will need to be replaced, either with additional rail capacity or with a smaller terminal. In either event, development on some or all of the existing PABT site would pay for a substantial portion of a new rail tunnel or bus facility. A full analysis of all costs and benefits should be performed and evaluated against other alternatives, including the Port Authority’s most recent proposal to rebuild the existing facility in place.